Reach thousands of international students at universities across the UK! GradLink UK is the award-winning careers and jobs site for international students and graduates who have or are studying in the UK. GradLink provides a range of services that enable businesses to reach thousands of high-quality international students at universities right across the UK. We are currently offering packages to potential sponsors of the GradLink site. All packages would include your logo across all key pages of the GradLink site. There are also options to be included on our social media and on our marketing materials. We′re award-winning: GradLink won the highly prestigious Times Higher Award for its ′Outstanding International Student Strategy′. We're universal: Students from over 120 UK universities are registred on GradLink. Database of 700+ employers based overseas - from PwC in Africa, to Deloitte in China, Standard Chartered in Singapore etc. GradLink is a winner of a highly prestigious THE Award for ′Outstanding International Student Strategy′. GradLink is produced by the University of the West of England, one of the largest universities in the UK, and winner of the Best University Careers Service 2014 Award (National Undergraduate Employability Awards). GradLink has first class links and contacts at university careers services throughout the UK. 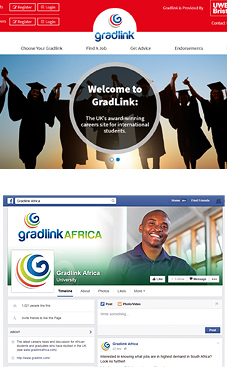 Awareness of GradLink is raised through the official network of UK university careers services. Many universities link to GradLink from their own university careers pages e.g. Oxford, London School of Economics, Durham, Manchester etc. GradLink presents at key careers events, including conferences run by the British Council, UKCISA and AGCAS. GradLink has represented the UK at major overseas careers conferences including British Council events in Asia and CareerCon Europe. Alternatively to find out more contact us on 0044 (0)117 328 2766 or at enquiries@gradlinkuk.com.